The Australian Honours system celebrates individuals who rise above the everyday and mark the extraordinary in our society. Awards are announced twice a year, on Australia Day and also on the Queen’s Birthday. Australia established its own honours system, the Order of Australia, on February 14th 1975 ‘for the purpose of according recognition to Australian citizens and other persons for achievement or for meritorious service’. Prior to this time, Australians were honoured under the British or Imperial Honours system. Medal (OAM) for service worthy of a particular recognition. This year’s Order of Australia award recipients celebrate Australia’s diversity. In addition to being Australian, recipients identified with an ancestral heritage from 30 different countries and 213 of the Australians honoured were born overseas. The youngest recipient is 26 and the oldest is 99. 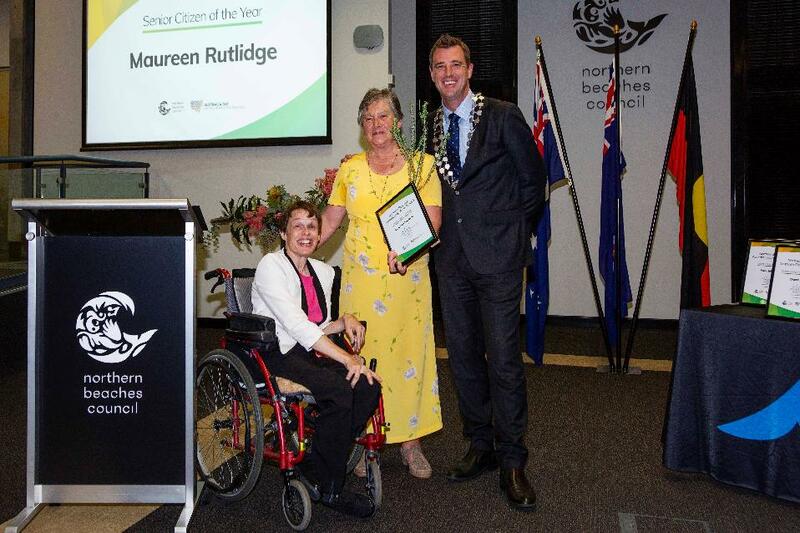 The number of women receiving an award in the Order has increased from a long term average of around 30% to 37.4% in 2019, however women are still under-represented - although that could not be stated to be the case for Pittwater. 'The Green Building Council of Australia’s long-serving leader, Romilly Madew, has been appointed Chief Executive Officer of Infrastructure Australia. Ms Madew’s appointment was announced by the Infrastructure Australia Board today and welcomed by Deputy Prime Minister Michael McCormack. “Recognised around the world as a leader in the property and construction industry, Romilly is an experienced CEO with expertise in strategy, governance and policy development. She has forged strong working relationships with industry, government and community stakeholders through her current role and previous executive positions, including as Executive Director ACT and Sustainability at the Property Council of Australia and the National Client Relationship Manager for law firm King & Wood Mallesons. “Romilly joins Infrastructure Australia at an incredibly important time for our organisation, and we are delighted to have her on board as we prepare to release the Australian Infrastructure Audit in mid-2019 and begin work on the next Australian Infrastructure Plan,” Ms Alroe said. Ms Madew said she was honoured to begin a new chapter as Chief Executive of Infrastructure Australia as the organisation prepares to release two landmark documents. “Infrastructure Australia has a critical role to play in helping governments prioritise projects and reforms that best serve our communities. I look forward to growing the organisation's focus on delivering better outcomes for individual users across transport, energy, telecommunications, water and social infrastructure,” Ms Madew said. Ms Madew will begin her new role in April 2019. While Romilly leads the way in contributing to that bigger vision for Australia so many have, there are among this year's lists some notable innovators without whom we would not have what they began and contributors to community whose efforts have brought joy to many or that shoulder needed. Honours help define, encourage and reinforce national aspirations, ideals and standards by identifying role models. They recognise, celebrate and say thank you to those who make a difference, achieve their best or serve others. By Governor General of the Commonwealth of Australia, His Excellency General the Honourable Sir Peter Cosgrove AK MC (Retd). Chief Executive Officer, Green Building Council of Australia, since 2006. Executive Committee member, Australian Sustainable Built Environment Council, since 2012. Non-Executive Director, Sydney Olympic Park Authority, since 2016. Board Member, Australian Government Cities Reference Group, since 2017. Member, National Sustainable Development Council, since 2017. Deputy President, Australian Sustainable Built Environment Council, 2012 - 2017. Co-Founder, Built Environment Meet Parliament Conference, 2008-2014. Co-Founder and co-host, Green Cities Conference, 2007-2018. Member, Nestl Creating Shared Value Roundtable, 2016-2017. Member, Steering Committee, Clean Air and Urban Landscapes Hub, 2015-2017. Board Member and Executive Committee Member, World Green Building Council, 2012-2016. Member, Australian Government's Expert Reference Group, Emissions Reduction Fund, 2014-2015. Co-Chair, Global Coalition of Green Schools, 2013-2014. Chair, ASBEC Cities and Regions Taskforce, 2010-2014. Chair, WorldGBC International Rating Tools Task Group, 2011,2014. Council Member, Australian Government National Sustainability Council, 2013-2013. Member, Australian Government National Urban Policy Forum, 2012-2013. Member, China/Australia Services Sector Forum, 2012. Member, Independent Expert Group, Australian Government Climate Adaptation Outlook Group, 2012-2013. Director, ACT Government Land Development Agency, 2005-2008. Reference Group, Urban Committee, Audit and Marketing Committee, Design Review Panel, 2005-2008. Past Member, Greater Sydney Commission Environment Reference 2017. Consultant author, 'Dollars & Sense of Green Building', 2006. Independent Chair, Currawong State Park Advisory Board, since 2015. Board member and member, Chief Executive Women, since 2012. President, Bilgola Beach Surf Life Saving Club, since 2013. Recipient, Chairman's Award, World Green Building Council, 2017. Recipient, International Leadership Award, US Green Building Council, 2015. Honorary Fellow, Planning Institute of Australia, 2015. Named 100 Women of Influence, Australian Financial Review and Westpac, 2012. Winner, National and NSW Telstra Business Women's Awards (Community and Government), 2009. For distinguished service to the print media through senior editorial roles, as a journalist, and to Indigenous education programs. Editor-in-Chief, 'The Australian', 2002-2015 and Editor, 1992-1995. Editor-in-Chief, 'Queensland Newspapers', and 'The Courier Mail', 1995-2002 and Journalist, 1984-1995. Journalist, 'The Australian Financial Review', 1981-1984. Journalist, 'The Brisbane Telegraph', 1973-1979. Ambassador, Australian Indigenous Education Foundation, since 2011. Director of Dialysis and Nephrology, Western Renal Service, since 1993. Clinical Nephrologist, Westmead Hospital, since 1988. Institute for Medical Research, current. Professor of Medicine, since 2004. Associate Dean, Westmead Medical School, 2006-2016. Head, Discipline of Medicine, 1995-2005. Has published over 300 peer-reviewed papers and 11 books. Renal Impairment' and 'Kidney Disease: Improving Global Outcomes'. Chair, Education Task Force, 2011-2017. Chair, Scientific Committee, World Congress of Nephrology Singapore, 2005. Chair, Scientific Committee, International Congress of Nephrology, Sydney, 1997. Chair, World Congress of Nephrology, Melbourne 2019, current. Board Member, Kidney Disease: Improving Global Outcomes, 2008-2016. Board Member, Kidney Health Australia, 2003-2008. Chair, Advisory Board, Australasian Kidney Trials Network, 2004-2017. Chair, Medical Staff Council, Westmead Hospital, 2011-2013. Editor in Chief, 'Nephrology', 2003-2010. Associe Etranger, French Academy of Medicine, 2017. Honorary Member, Japanese Society of Nephrology, 2017. Recipient, Richard Yu Awar, Hong Kong Society of Nephrology, 2017. Recipient, Distinguished Professorial Award, Sydney Medical School, University of Sydney, 2016. Recipient, Medical Staff Council Award for contributions to Westmead Hospital, 2016. Recipient, Priscilla Kincaid-Smith Award, Kidney Health Australia, 2012. Recipient, TJ Neale Award, Australian and New Zealand Society of Nephrology, 1998. For significant service to the broadcast and print media, and to community mental health groups. Film and television producer, and journalist. The Gruen Transfer, Gruen Nation, Gruen Sport, ABC TV, 2008-2012. Country Town Rescue, ABC TV, 2012. Can of Worms, Network Ten, 2011-2012. Hun Elders, ABC TV, 2008-2009. Enough Rope with Andrew Denton, ABC TV,2003-2008. Angels and Demons (Documentary), ABC TV, 2008. God on My Side (Feature Documentary), ABC TV, 2006. David Tench Tonight, Network Ten, 2006. Brothers in Arms (Documentary), ABC TV, 2005. 60 Minutes, Nine Network, 2001-2002 and 1989-1995. Surprise Surprise, Nine Network, 2001. Only Human, Nine Network, 2001. Sydney 2000, Seven Network, 1997. Missing Pieces, Seven Network, 1997. The Backpacker Murders, Seven Network, 1996.
Who Dares Win, Seven Network, 1996. Today Show, Nine Network, 1986-1989. Good Morning Australia, Network Ten, 1985-1986. Simon Townsend's Wonder World!, Network Ten, 1981. Authority Member, Australian Communications and Media Authority, since 2013. Managing Director, ITV Studios Australia, 2013-2015. Head of Development and Head of Production, Zapruder's Other Films, 2003-2012. Arts, since 2017 and Member, since 1984. Member, Screen Producers Association of Australia, since 2015 and Mentor, 2015-2016. Board Director, Arts Law Centre of Australia, 2013-2016. Supporter, Documentary Australia, since 2013. Editor, Paul Hamlyn Publishing Group. Established the Jacoby Walkley Scholarship and involved in its administration, since 2013. Member, National Advisory Board, since 2016. Member, the Co-conspirators Advisory Group, since 2013. Member, the B Keepers, since 2013. Member, New South Wales Advisory Committee, 2012-2017. Alzheimer's, Faculty of Medicine, Sydney University, 2007-2012. Member, Headspace Finance, Audit and Risk Committee, 2013-2016. Chair, 60th Anniversary (2019) Committee, since 2017. National Board's Communications and Media Advisor, since 2016. Advisory Board Member, since 2012. Founder and Director, David Malin Images, since 2001. Principal Research/Photographic Scientist, Australian Astronomical Observatory, 1975-2001. Adjunct Professor of Scientific Photography, RMIT University, since 2003. Discovered galaxy 'Malin 1', 1986. 'Ancient Light: A Portrait of the Universe', Phaidon Press, 2010. 'The Invisible Universe, Bulfinch Press', 1999. 'A View of the Universe', Cambridge University Press, 1993. Inspired the David Malin Awards for astronomical photography, 2004. Recipient, Hubble Award at the Advanced Imaging Conference, 2006. Recipient, Honorary Doctorate of Applied Science, RMIT University, 2003. Recipient, Lennart Nilsson Award for outstanding imaging in science, 2000. Elected Fellow, International Academy of Astronautics, 1998. Recipient, University of NSW Press/Eureka Science Book Prize for 'A View of the Universe', 1994. Recipient, Commonwealth Medal of the Australian Photographic Society, 1993. Recipient, Progress Medal, Photographic Society of America, 1993. Recipient, Rodman Medal, Royal Photographic Society, 1990. Recipient, Jackson-Gwilt Medal, Royal Astronomical Society, 1986. Recipient, Henri Chretien Award, American Astronomical Society, 1985. David Malin looking at a poster about Malin 1 the first galaxy to be discovered by him. Founder and Perpetual Board Member, Australian Charities Fund/Workplace Giving, since 2002. Co-Founder/Sponsor, Provost Scholarship to Oxford, since 2016. Sponsor, Aurora Project, since 2007. Founder/Sponsor, King Street Associates, since 2017. Founder/Sponsor, HOPE - Home Owners Partnering Equity/Affordable House, since 2017. Sponsor, The Fathering Project, since 2015. Sponsor, Christians Against Poverty, since 2012. Founding Sponsor and Partner, Springboard Enterprises, 2012. Host, Bridge Street Fellowship, since 2010. Supporter, Future Directions International, since 2006. Supporter, National Student Leadership Forum. Patron, Oxford Business Alumni Association, since 2010. Life Governor, Northcott, since 2010. Sponsor, The Freedom Hub, 2016. Founder, International Screen Academy, 2013. Chairman's Leadership Circle, Sydney Opera House, since 2008. Founder/Sponsor, Effective Ministry, since 2005. Sponsor, Centre for Ministry Development, since 2013. Founder/Sponsor, Young Street Initiative, since 2014. Board Member, Ravenswood School, 1996-2008. Founder and Chairman, Pacific Equity Partners, since 1998. Chairman and Managing Partner, Australasian and African Operations, Bain and Co, 1993-1998. Board Member, Karpin Committee, 1992-1995. Founding Partner, LEK Partnership, 1983. Vietnam Director, Animals Asia, since 2005. Research Team Leader, Novartis Australia, 1989-1991. Founding Member, Asia Canine Protection Association, since 2013. Former Manager, Veterinary Clinic, Hanoi, Vietnam. 2004-2005. Former Volunteer Technical Advisor, National Veterinary Diagnostic Centre, Vietnam, 2003-2004. Former Volunteer Technical Advisor, Department of Animal Health, Vietnam, 2002-2003. Former, United Nations Volunteer, Vietnam, 2001-2002. Research Initiator, Division of Livestock Industries, 1991-2000. Research Assistant, Division of Livestock Industries, 1985-1989. For service to the surfboard manufacturing industry, and to the community. Founder, Bennett Surfboards, since 1960. Founder, Dion Chemicals (Bennett Foam Australia), 1962. Former Member, Bronte Surf Life Saving Club. Former Member, Avoca Surf Life Saving Club. Board and Ski Captain, early 1980's. Inductee, Australian Surfing Hall of Fame, 2016. Inductee, International Surfboard Builders Hall of Fame (United States of America), 2009. Recipient, Life Membership, Manly Life Saving Club, 2004. Teacher, Better Hearing Australia, since 2006. Volunteer, Manly Warringah Community Aid, 2001-2015. Volunteer French Teacher, Balgowlah School for Seniors, since 2000. Diocesan Spiritual Advisor, Regional Council, since 2017. President, St Rose Conference, since circa 2006. Chair, Community Connect, since 2014. Volunteer, Narrabeen Club, Surf Life Saving Australia, six years. Crew Member, Paul Jackman Rescue Jett boat Service, three years. Cub Leader, 1st Collaroy Plateau Group, for 8 years in the 1980s. Qualified Mate, Volunteer Coastal Patrol, two years. Volunteer, Matt Talbot Home for Homeless Men, two years. Minister of Communion, Narrabeen War Veterans Homes, over ten years. Northern New South Wales Delegate, since 2015. Clan Society Delegate, for 20 years. Overseas Australian Delegate, 2 years. Host, Manly Scottish Gathering and Band Recital, five years. Chieftain, Warringah Scottish Society, current and Publicity Officer, until 2018. Former Secretary, Australian Irish Association. Director, Furlough House Retirement Village, since 2014. Member, National Committee, 5th Battalion, Royal Australian Regiment Association, since 2005. Life Membership, New South Wales Branch, Returned and Services League, 2017. Director, Joint Chairman, since 2015. Co-Chairman, Director and Secretary, since 2014. Founding Director, Mainbrace Constructions, since 1989. Worked during the Victorian Bushfires 2009, assisting injured wildlife. Provides education sessions to wildlife careers, current. Teacher, Wildlife Training Courses, 2011-2018. Teacher, Animal Care Course, since 2010. Provided emergency work in Kathmandu, Nepal, 2011-2017. Registrar, Anaesthetics, Calvary Hospital, 2002-2004. Hospitals, New South Wales South Coast, 2002-2012. Relief anaesthetist and teaching anaesthesia, Borneo, 2005-2007. Consultant to Government of Jakarta to rebuild/refurbish a wildlife hospital, upgrade anaesthetic services and advise on animal welfare, 1980-2007. Lecturer, Veterinary Science, University of Sydney, 1992-1994. Lecturer, Veterinary Science, Macquarie University, 1992-1994. Scholarship, University of Sydney and Taronga Zoo to study wildlife medicine and research oxygen transport during wildlife anaesthesia, 1992-1993. Part-time Director, Emergency Department, Mona Vale Hospital, 1983-1992. Veterinarian, Private Veterinary Practice and Wildlife Rescues, 1972-2018. Recipient, Service to Humanity Alumni Award, Sydney University School of Veterinary Science, 2017. Recipient, Senior Volunteer Award, New South Wales Government, 2013. Recipient, Volunteers Award, Pittwater Council, 2010. Recipient, Volunteer Award, New South Wales Government, 2010. Member Representing SIRA, Pittwater User Group, a community group concerned with the best and fairest use of the waterway of Pittwater, since 2009. Member, Built Environment Group, 3 years, including development 'Steps to a Sustainable Home' booklet. Member, since 1998 and 1966-1970. Member, Avalon Beach Village Chamber of Commerce, 1985-2006. Convenor, Angophora Reserve Bushcare Group, current. Past Executive Committee Member, Avalon Preservation Trust. Recipient, NSW Premier's Volunteer Recognition Program Award, 2017. Recipient, Long Service Award, Avalon Beach Surf Club, 2015. Recipient, Pittwater Medal, Pittwater Council, 2002. Local Competitions Administrator, since 1985. Former Secretary, Board of Directors. Recipient, Life Membership, Manly Warringah Basketball Association. The Volunteer of the Year Award for the Manly Warringah Basketball Association is named after Eileen and her late husband. Director, Manly Fun Run, 2013. Chair, Audit Risk and Compliance Committee, 2014-2016. Former Chair, Nomination Governance and Renumeration Committee. Former Chair, Redevelopment Steering Committee. Chief Executive Officer, ING Insurance Spain, 2003-2006. Country Manager Argentina, ING, 2001-2003. Chair, Centre of Conductive Education Project, 1988-1999. President, Rotary Club of Pittwater, 1993-1994. It’s no surprise there were so many great achievements among the winners for this year’s Australia Day Awards. Recipients included a passionate wildlife rescuer, environmental warrior, founder of a youth suicide prevention charity and a representative of the Australian Wallabies squad.